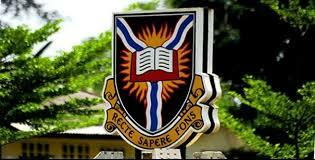 The University of Ibadan, UI Statements on 2016/2017 Sessional Examination Results, Matters Arising and Admission Process Analysis for 2016/2017, 2017/2018 Academic Session. The Senate of the University of Ibadan at its meeting held on Monday, 19 March 2018 and Tuesday, 20 March, 2018, considered the results of the Final Year and Non-Final Year Results for the 2016/2017 Session, respectively. We are delighted that the performance of our students was generally good. In particular, a total of 142 of our Final Year students earned a First Class Honours degree. The Faculties of Science and Technology tied in the overall best position with 37 students in each of the Faculties finishing with First Class. Twenty one of our students in the Faculty of Law earned First Class; this is the best ever result by the Faculty since its establishment 38 years ago. 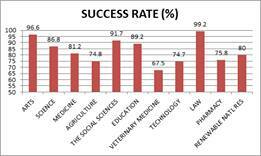 Similarly, in the unclassified degree programmes, a number of students had distinction in various courses. These include 13 students in Bachelor of Physiotherapy, 13 in Doctor of Veterinary Medicine and 18 with Bachelor of Pharmacy. 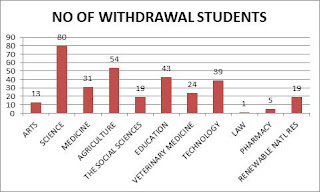 It can be observed that students in the science-based disciplines in particular did not perform too well, with the pass rate being lowest at 67.5% at the Faculty of Veterinary Medicine. On the other hand, the Humanities-based discipline posted better results, with the best coming from the Faculty of Law at 99.2%. Moreover, another set, comprising 115 students, were unable to meet Faculty requirements and have been advised appropriately to apply for change of course. With the restoration of Post-UTME for the new intakes, we are optimistic for an improved performance for the new students due to enroll at the beginning of the 2017/2018 session. Moreover, Senate has taken a number of strategic decisions aimed at a continuous improvement of the standard of training and learning at the University of Ibadan. Implementation will commence with immediate effect. Fig 2 Number of 100 Level Students requested to Withdraw from the University of Ibadan at the End of the of the 2016/2017 Session on the basis of Poor Academic Performance.